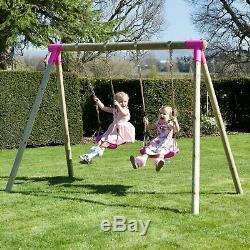 Rebo Junior Range Wooden Garden Swing Set - Different Styles. Rebos new Junior Range of Wooden Garden Swing Sets are great for small children, their lower frame height allows for a more controlled swing and provides younger children with a sense of security from being closer to the ground and not swinging too high. These gorgeous compact wooden swing sets are constructed from FSC pressure treated timber with powder coated steel frame brackets and high quality swing components as well as strong durable moulded plastic swing seats. These wooden swing sets are made to last, with each swing frame taking advantage of the amazing qualities of natural round wood timber, utilising its inherent strength and the resilience that comes from using the whole tree trunk which allows the timber to expand and contract with the elements along the woods natural fracture lines without compromising the swing frames integrity. Warning: We recommend small children are supervised by an adult at all times while on play equipment. Lower Frame height perfect for younger children. Natural Wood Frame can expand and contract with the elements. Tough wipe clean Plastic Swing Seat. Maximum user weight for single swing seat 60KG. Baby Seat Ergonomically shaped backrest for secure fit and comfort. Maximum user weight for Baby Seat 40KG. Maximum user weight for Nest Swing 50KG. Single Swing Frame Frame W120 x D140 x H170. Double Swing Frame W220 x D140 x H170. Nest Swing Frame - W170 x D140 x H170. Nest and Single Swing Frame - W270 x D140 x H170. This product has no reviews yet, however see what our buyers say about our other products.. The UK mainland consists of England, Scotland (excluding Highlands & Islands) and Wales. Please note that for the purposes of this definition, Northern Ireland, Isle of Man, Scilly Isles, Scottish Highlands & Islands, Jersey and Guernsey are not considered part of the UK mainland. When will I get my item? However, please note that this is not 100% guaranteed and we generally indicate a 48 hour deliver on most products to allow for delays and courier issues. PLEASE NOTE: Larger items, for example Quads, Climbing frames etc. Unfortunately, time specific deliveries are not possible at present - deliveries take place between 8am - 5.30pm each day. Will I have to sign for my order? Yes, the carrier will not leave a parcel without a signature. This is for your and our security. How do I return an item? Depending on where you live, the time it may take for your exchanged product to reach you, may vary. The item "Rebo Junior Range Wooden Garden Swing Set Different Styles" is in sale since Friday, March 29, 2019. This item is in the category "Toys & Games\Outdoor Toys & Activities\Swings". The seller is "outdoortoy" and is located in Welshpool.